Available in Black and Gold. 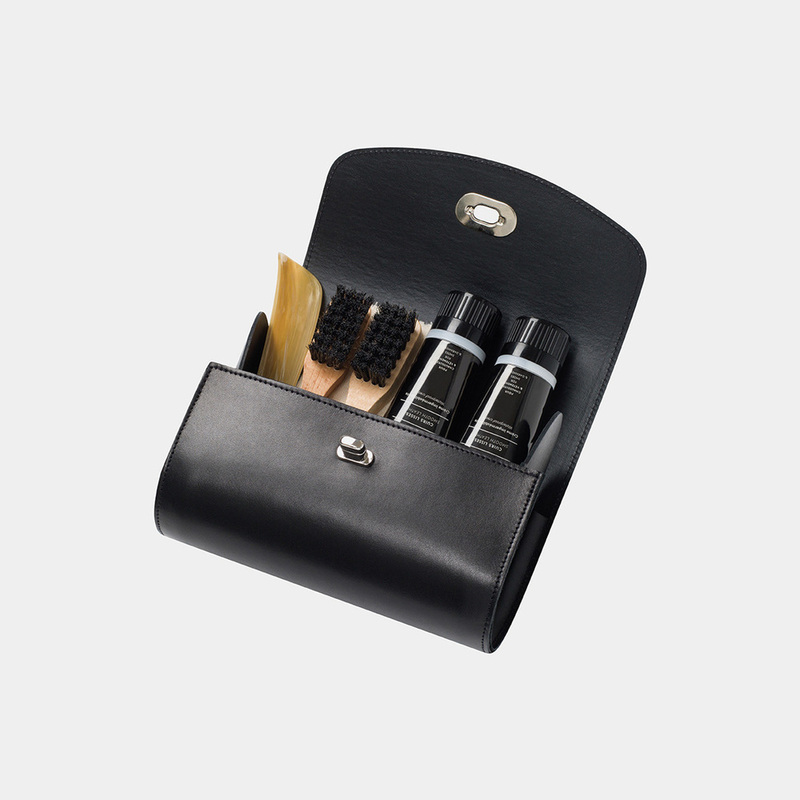 The Business Kit contains : 1 neutral crème de beauté, 1 black crème de beauté, 1 bubenga white bristles badger brush, 1 bubenga black bristles badger brush, 1 neutral crème délicate, 1 horn made shoehorn, 1 Famaco cloth. The Travel Pack contains : 1 neutral Sil Best, 1 black Sil best, 2 applicator brushes black brustles, 1 cloth 40cmx40cm. Available in Black-Red and Black-Grey. The Diligence pack contains : 1 black crème de beauté, 1 neutral crème de beauté, 2 applicator brushes black bristles, 1 cloth 40x40cm. The Pied Cireur Kit contains : 1 Medium Brown Cirage de luxe, 1 Black Cirage de luxe, 1 applicator brush - withe bristles, 1 applicator brush - black bristles, 1 standard polishing brush, 1 Raviv Cuir, 1 cloth 40cmx40cm. 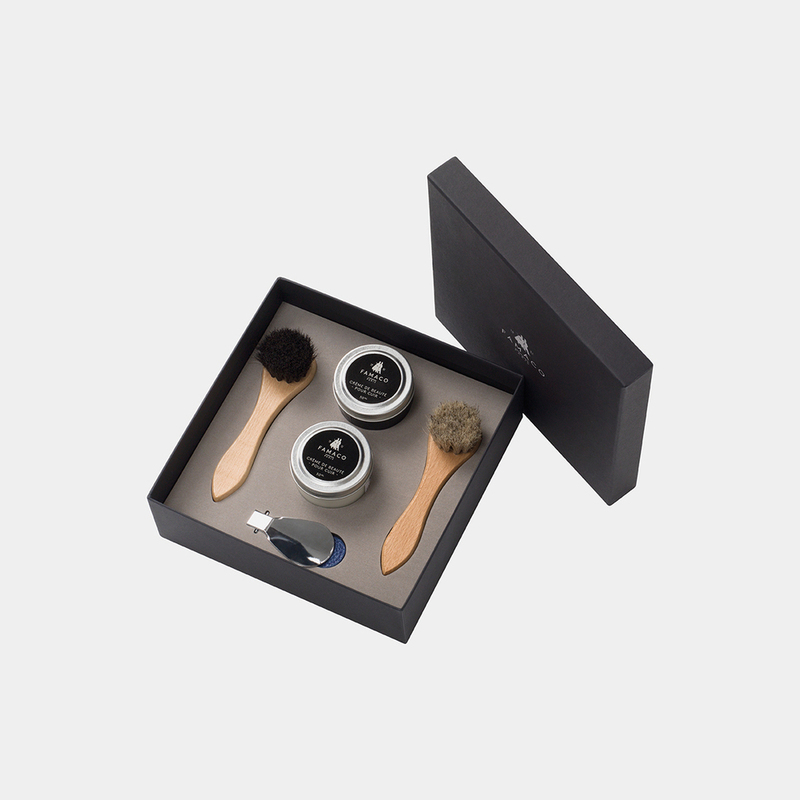 The Large Cube Kit contains: 4 tubs of cream, 1 tin clear beeswax polish, polish, 1 tin black beeswax polish, 1 tinBrown beeswax polish, 1 Gentle Cream 125 ml, 2 small Bubenga wood dauber brushes - light bristles, 1 small dauber brush, 1 Bubenga wood polishing brush- light bristles, 1 Bubenga wood polishing brush - dark bristles, 1 Waterproof protector 250 ml, 1 Suede Renovator250 ml, 1 Polish with lanolin 250 ml, 1 shoe buffer 40cm x 40cm. The Princess Kit contains : 7 Crèmes de beauté , 1 neutral cirage de luxe, 1 black cirage de luxe , 1 Creme délicate , 1 large Bubenga wood applicator brush -white bristles , 1 large Buenga applicator brush- black bristles, 1 small Bubenga wood applicator brush - white bristles, 1 small Buenga applicator brush- black bristles, 1 Bubenga wood polishing brush- white bristles, 1 Bubenga wood polishing brush - black bristles. 1 Bubenga wood welt brush - white bristles, 1 Bubenga Wood - black Bristles. The Cezanne Kit contains : 1 Famaco cloth, 1 neutral shoe cream, 1 black shoe cream, 2 badger brushes, 1 polishing brush grey hair, 1 Crème délicate, 1 plastic shoe horn 16cm.